Revive and Protect your car this Autumn! AUTO REVIVE provide Professional Auto Detailing, cleaning and reconditioning services to our clients Mobile Service (SOR) Suburbs listed below. A Shampoo wash a paint clean detail and a brand new application of protective wax. via Machine and Hand and includes minor scratch removal. Not a wash n wax out of a pressure washer. * Auto Revive Shampoo Seats and Carpets or leather cleaned and reconditioned . Not just a vacuum and wipe over. 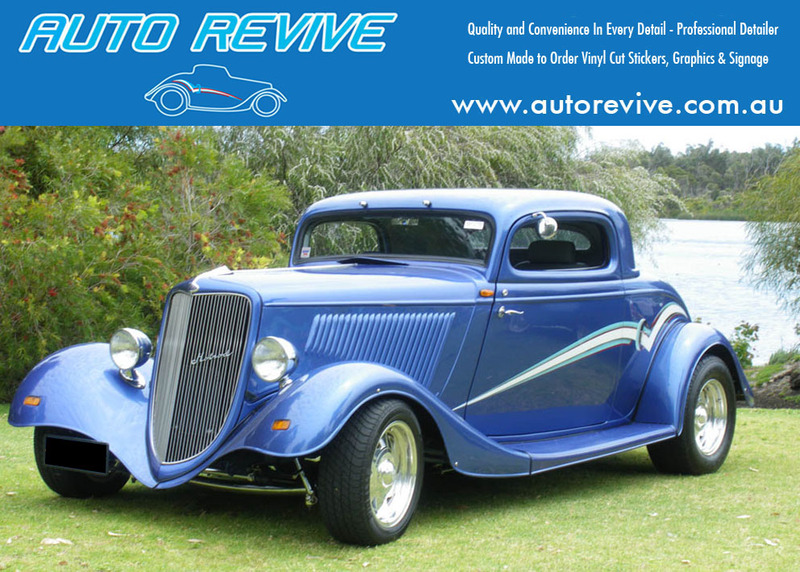 Havng your car professionally waxed By Auto Revive and it should last for several Months. Providing excellence in Auto Detailing industry. * Carnauba wax application. (deep gloss and protection) Clear Coat Safe. * Minor Scratch removal and Spot Compounding Included Only. * Require access to tap and power outlet within 20m of car. as this be treated a spam. Easy to follow instructions included. (Apply yourself and save! Or we can apply for you at a small additional charge. Or $195.00 for 2 Doors Only. Or $295.00 for 2 doors and Rear Window. * Choose your colour Vinyl – Choose your font style – Choose your size required. * Discount does not include application this is a optional extra charge. * Graphics and logos may incur a extra artwork charge if not vinyl cut ready. Pick a Font you like from font catalogue download from my website. or send me the font you have. Artwork is free for vinyl cut out letters only. PDF Proof is sent before cutting for approval. Cut Vinyl Stickers are great for single colour logos or lettering for windows, vehicles, , Boats, Construction Equipment and any other smooth surface. Our Cut Vinyl stickers are a premium vinyl 5 – 8 year and can suitable for outdoor durable for many years. Custom cuts are no additional cost. Order over $20 require payment first via Cash Before any work is done. Cut out while you wait if simple. Artwork is free for vinyl cut out letters, graphics and logos in my catalogues. Graphics and Logos may incur a extra artwork charge. I have many graphics, sayings and logos in my catalogues. PDF Screen shot is sent before cutting for approval. * DIY application and Save! DELUXE CAR DETAIL GIFT VOUCHERS – Available Now! For the person who is hard to buy for car lover or too busy to do it for themselves. *Price depends on size of car and condition and service required. *Must be with in my work area. of SUBURBS in Cockburn, Melville, Fremantle. Must be paid for UPFRONT FOR THE VOUCHER. · May be installed on building. * Graphics and logos may incur a set artwork charge if not vinyl cut ready. Option with a 2 Colour Logo $40.00 extra. *Payment required before processing order and cutting out. Screen shot or PDF send before cutting out. Having your vehicle can be low-cost and very effective. Vehicle signage is our specialty. We use the highest quality materials . REAR WINDOW Vinyl Cut Sticker Sign. Custom made to order up to 2 vinyl colours. This is the perfect Sign for a Rear Window of your Vehicle! Driving or at the traffic light or parked it will get you more business. Bonus free sticker size 580 mm x 500 for the rear. Vinyl Cut Sticker Signs Includes Basic artwork Layout. Premium outdoor vinyl 5- 8 year. DIY application (Instructions and Layout sheet supplied. Application if required by Auto Revivea extra charge. DIY application ( instructions and Layout sheet supplied. Application by Auto revive a extra charge. Payment is required upfront before ordering vinyl and cutting out. Screen shot is sent before cutting for approval. If application is required this can be paid on the day in cash. Custom made to order up to 2 vinyl colours max. * Choose your Vinyl Colours. * Choose your size required.